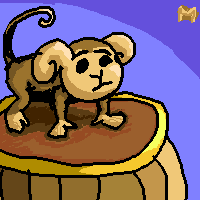 I was wondering whether you'd create a pic of the monkey by itself. Side note; when I compare this pic to the previous picture, the old monkey looked somewhat like a disgruntled rodent; this is way more "monkey'ish". Isn't he the main character of super Monkey Ball ? what's it doing on that barrel?